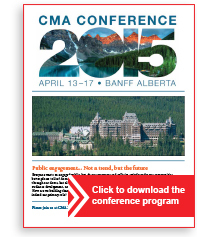 Over 400 museum professionals attended the 2015 National Conference in beautiful Banff, sharing their thoughts and ideas with millions more through Twitter, with the hashtag #CMAMC2015. Delegates discussed how public engagement plays a vital role in museums and how cultural institutions make communities better places to live. 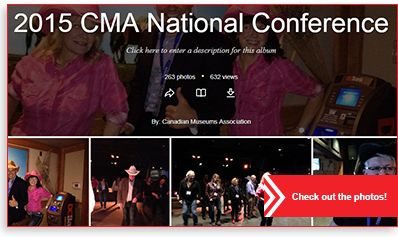 We unveiled the brand new CMA Online Discussion Group with the first topic of discussion being museums and climate change. The sustainability of our institutions is at a critical turning point. With government grants and private contributions falling, institutions are looking for alternate and innovative revenue and partnership strategies. Can one of the answers be found in travelling exhibitions? Produced by a large cast of characters, travelling exhibitions or programs commence with the strength and depth of a collection, a curator’s idea, a director’s enthusiasm, a partnership opportunity through to the critical support of the Board of Directors and sponsors. Travelling exhibitions can have educational value and be exquisitely designed. They need to be dynamic. They can reach a great number of visitors and introduce new audiences for the hosting institution. Or they can fall flat on their face. The value and eventual success or failure is in the concept, the integrity of the selected objects and the functionality and versatility of the design. The Symposium was particularly recommended for staff of both borrowers and lending institutions — curators, registrars, travelling exhibition coordinators, exhibition designers, development and marketing officers. 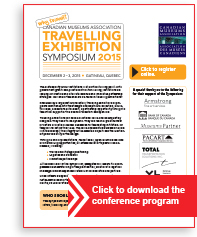 The Symposium was held at the Four Points by Sheraton Hotel & Conference Centre in Gatineau.